Almost 500 thousand Ukrainians have received residence permanent residence permits in the EU in 2015. 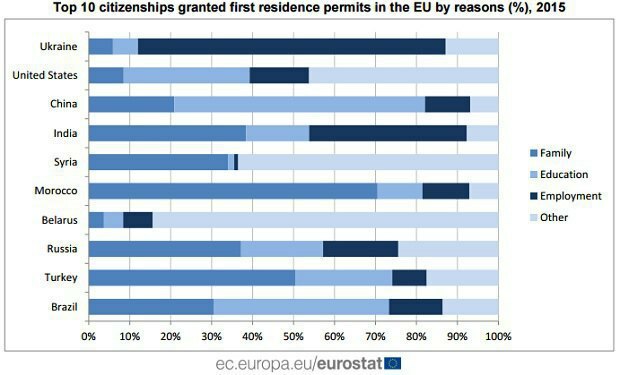 In total, EU countries have issued a record number of permanent residence permits in the last year since 2008 - 2.6 million, which is 12.1% more than in 2014. Every fourth residence permit was issued by the United Kingdom, one in five - Poland. Next in the number of permits issued goes France, Germany, Spain and Italy. Ukrainians mostly received residence permits for the purpose of employment (75.2%), the Chinese - for education (61.2%), Moroccans - for family reasons (70.5%). Ukrainians are mainly get residence in Poland (86%, or 430.1 thousand people). In 2014, Ukrainians received 302.7 thousand residence permits in the EU.